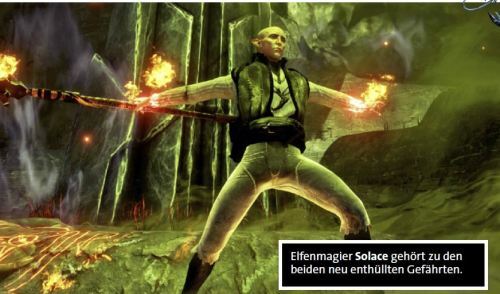 A reporter for the magazine Gamestar was at the Bioware studios a while back, and they have now released an article about Dragon Age: Inquisition in their April, 2014 issue. There are quite a few translations of the article, which is in German, around the internet on various fan sites, but we've been warned by Patrick Weekes not to go leaping to conclusions until we can read it in our own language. The article apparently mentions two new companions, at the very least, so I hope someone can translate the article correctly. If I can find a good translation, I'll post it here. Here is the German article, for any of you who can read it. Here's the discussion about it on the Bioware forums.